Congratulations to all our 2019 Award winners and runners-up! 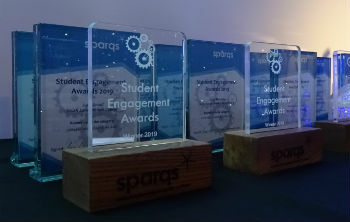 We were delighted to hold the third sparqs' Student Engagement Awards at the end of our conference on Thursday 28th March 2019! In a fantastic end to the day, the Awards recognised and celebrated good practice across Scottish colleges and universities. Congratulations to all the Award winners and runners-up, and many thanks to all who submitted entries, the standard was once again extremely high and the panel members had a tough task choosing between them. 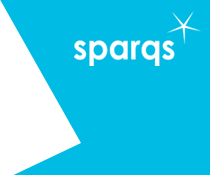 The reception was hosted by Professor Norman Sharp OBE, outgoing Chair of sparqs Trustee Board, in his final role as Chair. At the end of the Awards ceremony, we bid a fond farewell to Norman, presenting him with an Award to thank him and mark his invaluable contribution to sparqs over the last eight years. - click on each heading below to view the detailed category webpages . . .
An initiative delivered by a students’ association, or led by a students’ association in partnership with their university, which has had a significant impact on enhancing the student learning experience. An initiative delivered by a students’ association, or led by a students’ association in partnership with their college, which has had a significant impact on enhancing the student learning experience. A co-curricular initiative or project (focusing, for example, on students working in partnership with their college or university on curriculum design, curriculum delivery or assessment) which has had a positive impact on student learning across the college or university. An initiative delivered by a students’ association, or led by a students’ association in partnership with their college or university, which demonstrates a clear commitment to developing student engagement activities that reflect the diversity of the student population. Congratulations again to all the winners and runners-up! We hope you enjoy reading more about all the initiatives and nominees on the individual category webpages.